Try Tahini Oatmeal Cookies for a nut-free treat. Tahini isn’t just for hummous: it is also a key ingredient in many desserts and sweets. These Tahini Oatmeal Cookies are a good example. It is generally easy to find in grocery stores across Canada, but if it’s not available in yours, you can find it at a store that stocks food items from the Mediterranean and Middle East. Made from ground sesame seeds, tahini will separate like natural peanut butter does, as it doesn’t have any additives to keep the natural oils from rising to the top. Give your jar a good stir before measuring it out to get the proper consistency. The texture of these cookies is perfect: slightly chewy, with a little bit of crisp around the edges. This recipe makes 2 dozen large cookies. You can make them smaller for a larger yield. 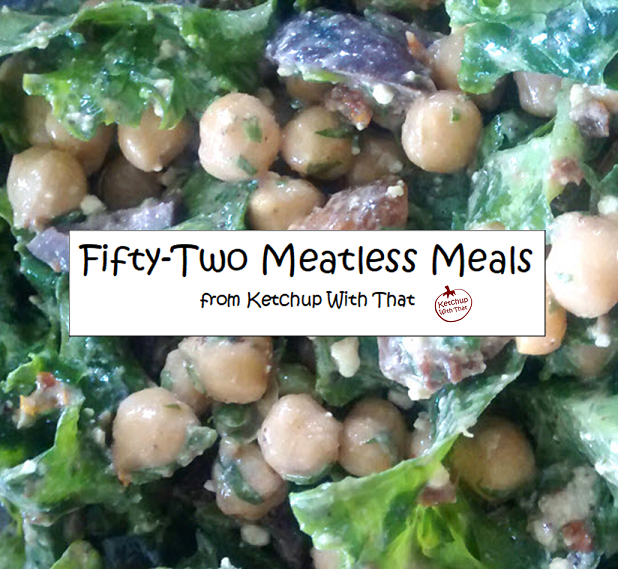 Check out the Ketchup With That archives for more vegan recipes. You can vary these cookies by adding raisins, dates, coconut and other dried fruit or nuts. The total amount of add ins can be up to two cups. See notes below the recipe for a non-vegan version of the cookies. Preheat oven to 375 degrees F / 200 degrees C. Line cookie sheets with parchment paper or grease lightly. In small bowl, mix non-dairy milk and lemon juice. Let this mixture sit while you begin preparing the recipe. In mixing bowl, lightly beat the aqua faba for a minute - it should look a bit foamy. Beat in the oil. Add the tahini and mix thoroughly. Beat in the white and brown sugar, vanilla and non-dairy milk + lemon juice mixture until the mixture is smooth. It will be thick. In separate bowl, stir together flours, baking soda, salt, oatmeal and chocolate chips (or other add ins). Stir the flour mixture into the tahini mixture until no streaks of flour remain and chocolate chips are even distributed. Scoop 2 tablespoons / 30 ml of dough and make balls. Place on cookie sheets. The cookies will spread, so leave room between them. 8 cookies to a sheet should give enough room. Press the balls down lightly with a fork, then bake for 12 minutes. Remove from the oven and let sit for a few minutes on tray to firm up, then remove to a rack to cool. The dough can be refrigerated for up to two days if you do not want to bake them right away. Use 2 eggs in place of aqua faba, and 1/4 cup / 60 ml sour cream in place of non-dairy milk + lemon juice.